Tan-coloured spots and necrotic blotches form on leaves. Infections often progress to shoots and stems. 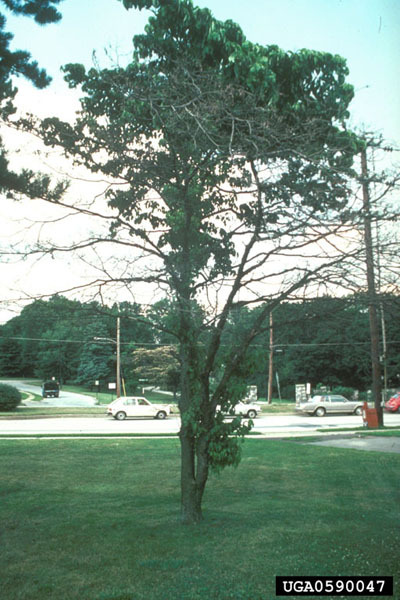 Dogwood anthracnose is a foliar disease caused by the Discula destructiva fungus. Initial symptoms are found on the leaves in the lower portion of the crown, progressing upward throughout the tree. 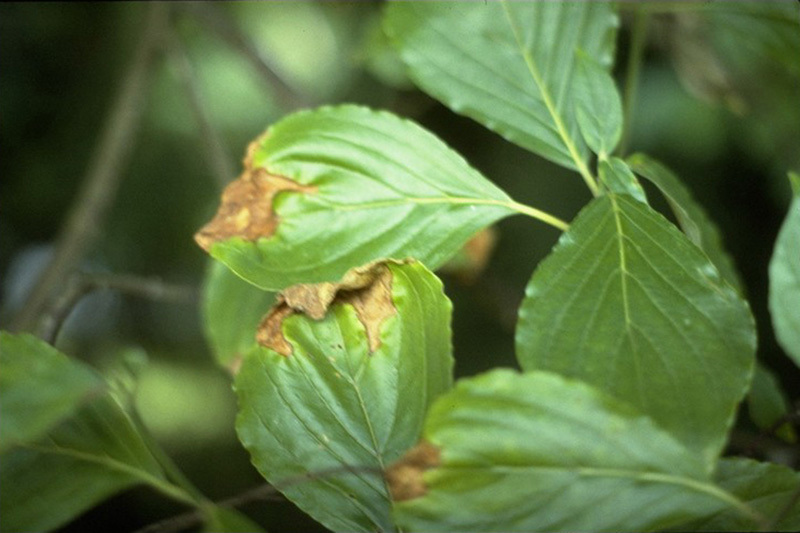 Leaves in shaded or very damp areas are the first infected. 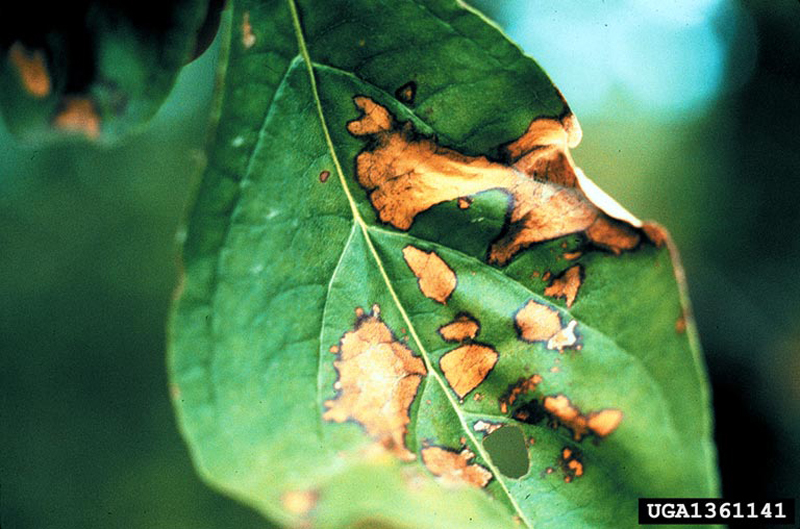 Tan-coloured leaf spots, which often develop a purple border between the dead and healthy leaf tissue, coalesce into large blotches. These spots may fall out leaving shot holes. Infected leaves may also develop necrotic vein and leaf margins. 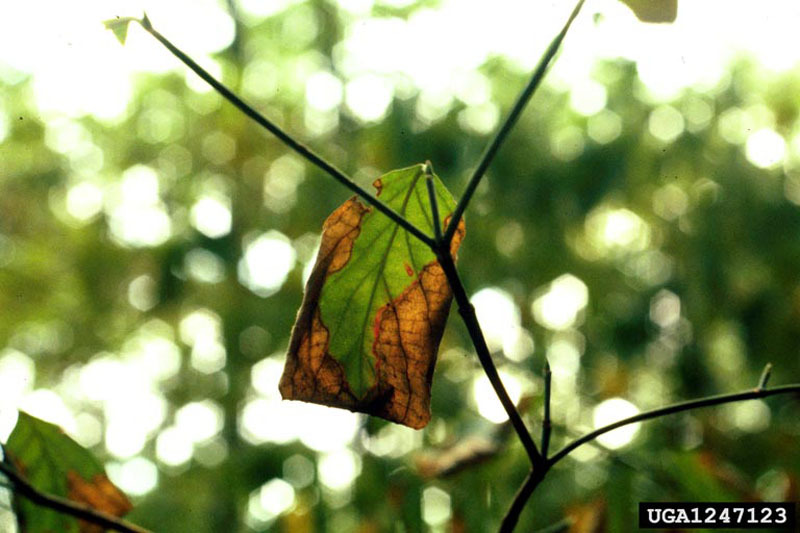 Heavily infected leaves may drop prematurely, or cling to the twigs long after normal leaf fall. 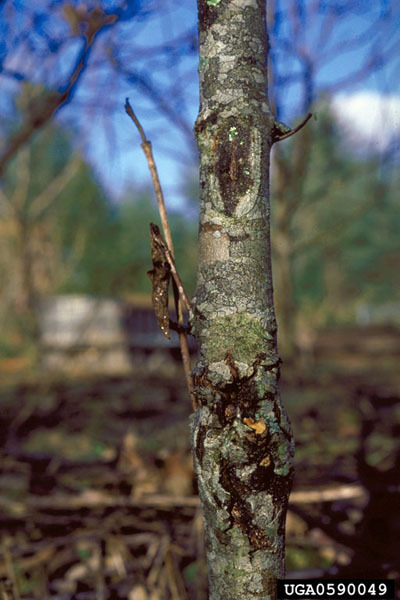 From the leaves, the infection can spread to twigs, buds and fruit, and ultimately to larger branches, where it forms large numbers of elliptically shaped cankers that girdle and kill the branches, and eventually the entire tree. The disease kills dogwoods of all sizes, but is most severe on young seedlings and in understory forest trees. Infection is most likely to occur during cool, wet weather in spring and fall, but can occur at any time during the growing season. Drought and winter injury appear to increase host susceptibility. Several years of infection have resulted in extensive mortality in both woodland and ornemental eastern flowering dogwoods in Ontario. A mortality rate of 46% was recorded at an ecological monitoring site from 1995 to 2000. The origin of the disease is unknown, but it is widely considered to be an exotic disease. Its presence in Canada, specifically in Ontario, was confirmed in 1998. 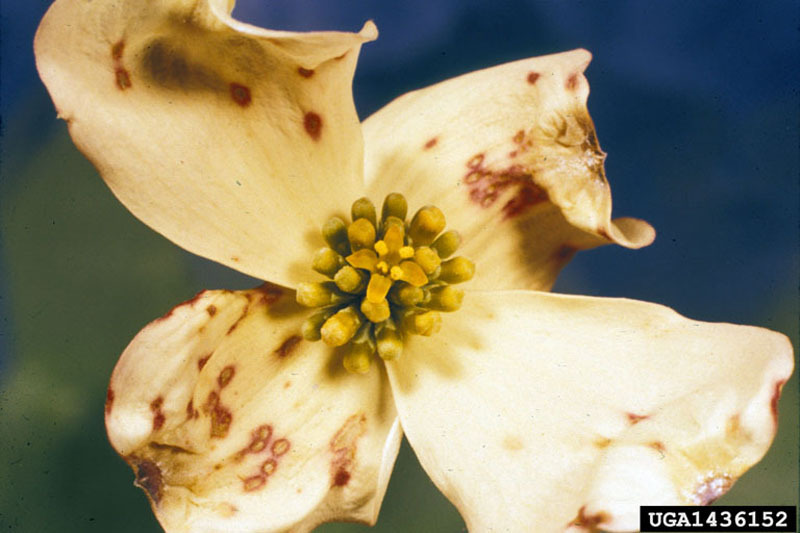 Anthracnose causes serious damage to two species of dogwood in natural habitats: eastern flowering dogwood (C. florida) and Pacific dogwood (C. nuttallii). These were also the species on which the responsible agent for the disease was discovered in 2003 in a nursery in Lombardy, Italy, and in a private garden in Germany. The disease was reported for the first time in the United States in 1978. Funk, A. 1985. Foliar fungi of western trees. Can. For. Serv., Pacific For. Cent., Victoria, B.C., Inf. Rep. BC-X-265. Knighten, J.L; Anderson, R.L. 1993. Distribution of dogwood anthracnose in the southeastern United States. USDA Forest Service FPM Rep. 93 - 1- 30. 11p. Sinclair, W.A. and Lyon, H.H. 2005. Diseases of trees and shrubs - Second edition. Comstock Publishing Associates, Cornell University Press, Ithaca, New York, 660 p.